About this time of year I feel like I have a little more time. Football and soccer are ending. I’ve caught up on all the projects that I put off over the summer. 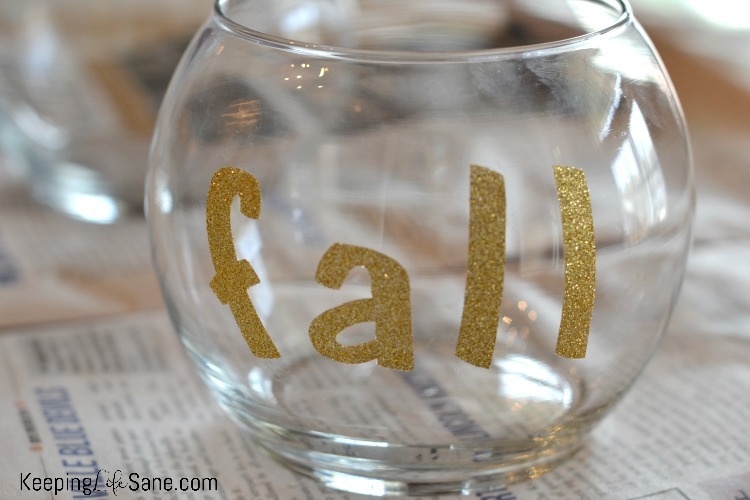 It’s time to start decorating for fall and Christmas! Yay! What a great time of year. 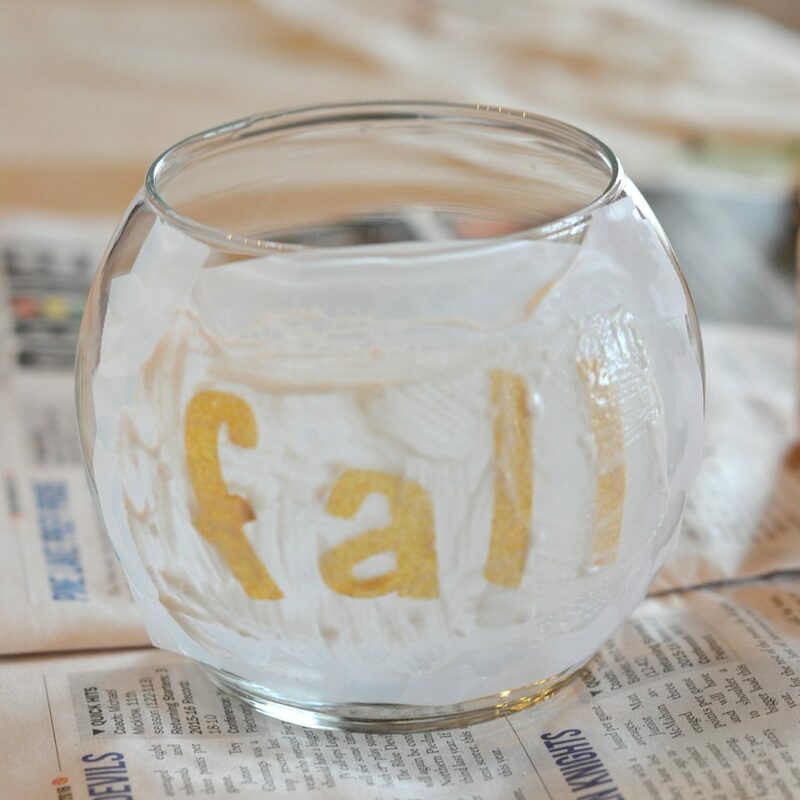 Last year I made a Christmas glass etching and I thought I would make another one for this fall. It’s really easy and doesn’t take anytime at all. First, I was out doing my regular shopping and found an inexpensive glass bowl. I thought this would be perfect to hold some dried cinnamon sticks, apples, leaves, etc. The first step in doing the glass etching is to find some stickers. I found some laying around the house that my daughter had. You can spell out whatever you want. 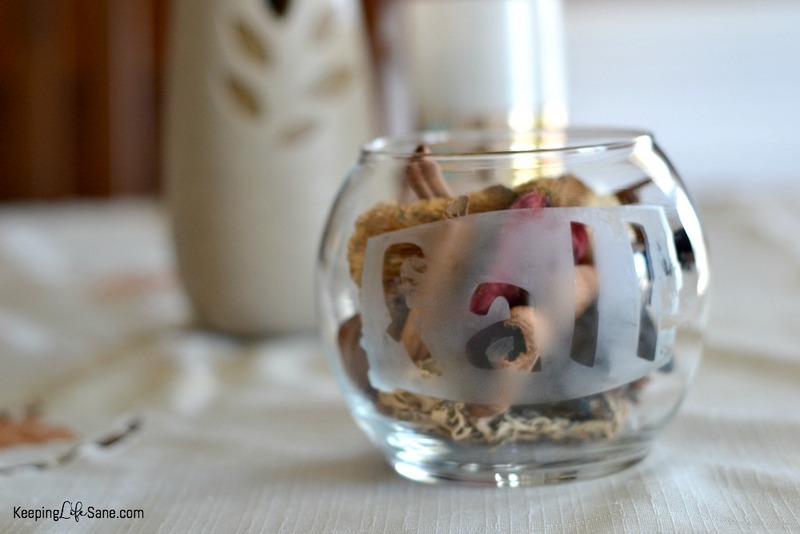 This would be perfect for any holiday or wedding centerpieces too! 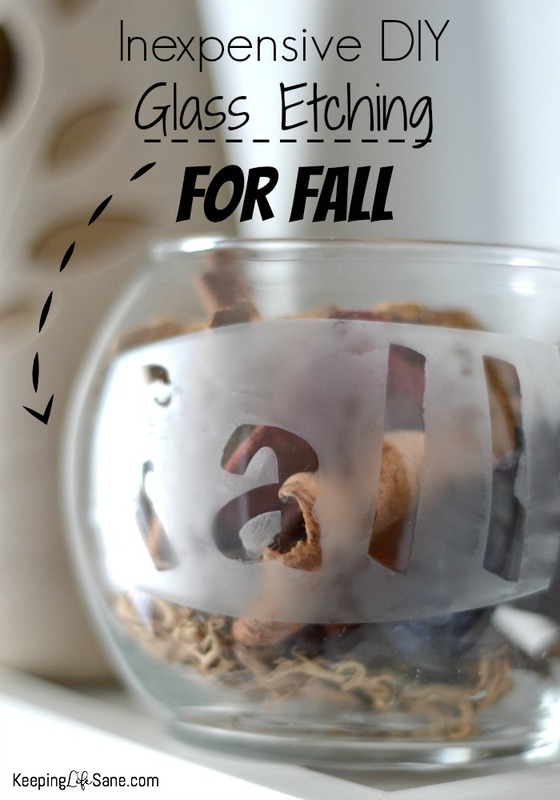 I spelled out FALL. Press the stickers down well and make sure the edges are secure. It doesn’t matter what they look like. The stickers are just used for the outline of the letters. I bought some glass etch at the local craft store. (You’ll need to follow the directions on your bottle because it could be different from what I’m doing!) This stuff is VERY strong and I recommend using gloves and keeping away from children. I shook it up well and used an old paintbrush (from the kids’ art box) and applied a heavy coat. Make sure you spread evenly over the area. Remember, wherever the etch goes, it will show up. You can’t really see it, but I put a border of scotch tape around the letters. I wanted to make a nice frame so the edges would be straight. After about 8 minutes, I went and rinsed off the glass etch and pulled off the stickers. Didn’t it turn out so cute? 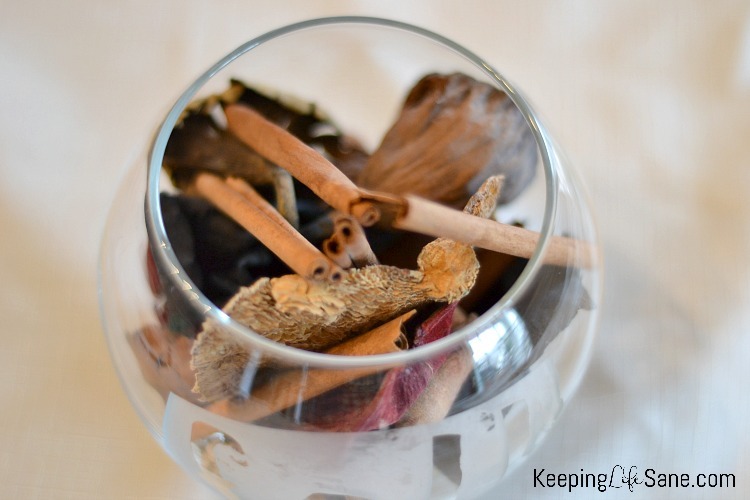 I added some cute unscented potpourri and added it to my bowl. The bowl fits perfectly on the shelf I have hanging in my foyer. It’s a place that every visitor sees and it’s nice to change out the decorations for the each season. I also found this great Glade® Automatic Spray Starter Kit and Glade® Automatic Refills at Harris Teeter. They had a HUGE display with a ton of scents for their Limited Edition Holiday collection. I thought I would pick it up and try it out. I decided to get Glade® Merry Fun™, which is vanilla (that I love) and Glade® Happy Glow™, which is apple cinnamon. It has an automatic timer you can set. You don’t have to worry about the house smelling bad. Look for the Shazam logo on the packaging! It’s an app and it’ll take you to Spotify playlists, videos, and GIVEAWAY!! Let me know if you have any questions about the etching and I’ll help you out. Good luck on decorating this season.